Woodland Hills, CA – Martialinfo.com, noted as the first internet-based martial arts resource center and considered as one of the premier news sites of the martial arts community, announced today the creation of a unique, martial arts Day Planner designed specifically to assist in organizational martial arts school management. Ably named the “Martial Arts Day Planner,” this nearly 400-page notebook addresses the needs of the martial arts school structure with the release of three carefully designed volumes including a 1) School Owner Planner, a 2) Martial Arts Instructor Planner, and 3) a Martial Arts Student Planner. “There are over 27,000 commercial martial arts schools in America of which I am one of. Whether a school has 10 students or 300 students, being organized is essential to running a successful studio. The Martial Arts Day Planner, unlike the ones you can buy in a stationary store, features on the needs and concerns of the community,” says school owner and Martialinfo.com CEO Fariborz Azhakh. Complete with daily, weekly and monthly goal settings and “to do” lists, each individual planner provides clean and attainable objectives and it is flexible enough to adjust to a variety of skills sets and requirements. “I believe it was Sun Tzu's 'Art of War,' who coined the phrase 'plan for what is difficult while it is easy, do what is great while it is small.' The martial arts is such a huge industry with so many students coming and going, being organized is the key and the Martial Arts Day Planner will enable school owners, instructor and students that opportunity,” says Michael Matsuda, president of the Martial Arts History Museum. Specific to the Planner, each day the user will enjoy harmonizing and motivational quotes, martial arts historical information, reminders of special martial arts events and goal-setting advice provided by a host of martial arts school owners. “The Martial Arts Day Planner is a very useful and effective planner that provides the owner, instructor and students with a comprehensive, structural workbook that will create a better learning environment. As a school owner for over 30 years, our needs aren't the same as those in a day-to-day office. We have belt testing, goal-setting and I feel that this planner looks at those issues and I believe this is an excellent step in running a better school,” adds Azhakh. To assist the martial arts community, a significant portion of every sales will be donated to the Martial Arts History Museum. The museum provides man opportunities for young people to learn about martial arts history, culture and tradition. “The museum is the only venue that will keep our history alive and Martialinfo.com has taken this very generous step in ensuring the legacy of the martial arts. I hope it encourages others to do the same,” adds Matsuda. 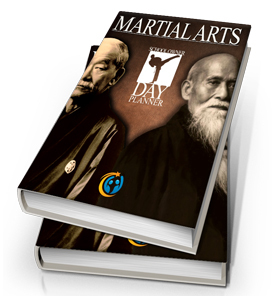 The Martial Arts Day Planner is now available and can be purchased at www.MartialArtsDayPlanner.com. Martialinfo can be visited at www.Martialinfo.com. The Martial Arts History Museum is located at 2319 W. Magnolia Blvd., Burbank, CA 91506 or you can visit their website at www.Mamuseum.org.